They were — but lost everything else. Midiyami, 50, says the police killed two young men suspected of being Maoist rebels, a group widely known as Naxals. Then they burned down her house; inside were rice and grain stored for the lean season, a few pieces of clothing and the family's life savings of about $70. In the past 12 months, Indian security forces have been trying to flush out the Maoists one by one, village by village. The campaign has been widely criticized for failing to distinguish ordinary villagers from insurgents, and the anger in Gumiyapal is palpable. "Those were not Naxals," says Midiyami's husband Guddi Kuta. "They were our men." Amresh Mishra, at the time police superintendent of Chhattisgarh state's Dantewada district, where Gumiyapal is situated, insists that the two killed were members of a Maoist militia; he rejects as "100% fake" the allegation that police burned down the house. "Naxals themselves have done this kind of thing to defame the security forces," he says. "The Naxals play every game." 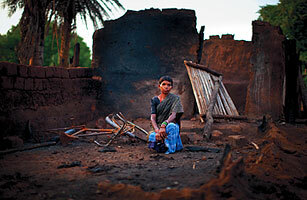 It is in villages like Gumiyapal that India's war against the Maoists will be won or lost. India's security establishment ignored the insurgents for years, expecting that the rebellion would lose steam and die out. It didn't. Rather, the insurgency has been organizing and expanding over the past decade in remote villages and forests, even as India's economic boom has enriched and empowered its cities. The Naxals, named for the eastern Indian village of Naxalbari where the movement has its roots, today have a presence in more than a third of India's 626 districts. Prime Minister Manmohan Singh says they are "the single biggest internal security challenge ever faced by our country." The unrest in Kashmir and the threat of jihadists may be just as urgent, but the Maoists have proved to be more resistant to political and military pressure. Since 2006, nearly 4,000 people have died in Maoist violence — 990 so far this year. Besides the human toll, the Naxal rebellion is significant on two counts: its durability and momentum when Maoism most everywhere else, even in China, is extinct — and the incongruity of it thriving in a country that is otherwise seen, at home and abroad, as a nation on the move. Now the Indian government has gotten serious about fighting the Naxals, driven partly by the realization that the insurgents can threaten economic growth without even leaving the forest. India's economic ambitions are fed by steel and power plants, and the country is intent on extracting coal, iron ore and other minerals from the same forests where the Maoists are strongest. Dantewada, the central theater of this conflict, has some of the richest iron deposits in the country. While India is still attracting billions in foreign capital, the Naxal conflict worries investors. Noted Deutsche Bank in an April 2 report: "Unless the Naxal resistance abates, the high levels of risk associated with doing business in Naxal-infested areas will deter investment and hold back the country's economic growth trajectory." The state of Chhattisgarh has accounted for 30% of Maoist-related deaths in India so far this year. As security forces have tried to encircle the Naxal stronghold there, the rebels have escalated the fight. In April, Maoists ambushed a paramilitary patrol near the village of Chintalnar, killing 76 men, India's worst-ever single incident of Maoist violence. The morning after the Gumiyapal incident on May 16, Naxals waited, with an improvised explosive device (IED), for a local bus carrying security forces returning from that operation back to their barracks. It was a rare and brutal attack on a civilian target. The IED killed 36 people on the bus — 24 of them civilians. The Maoists have also unleashed a wave of kidnappings, demanding in return the release of their captured comrades and the end of the offensive against them. On Sept. 19, seven Chhattisgarh policemen were abducted by the Naxals; three were killed. India's war against the Naxals is a tactical challenge — the difficulty of fighting a guerrilla movement with a conventional force. But it is also an existential struggle. At independence, Jawaharlal Nehru imagined a nation dedicated to Mohandas Gandhi's ideal "to wipe every tear from every eye." Today's leaders have a less sentimental vision. Prime Minister Singh acknowledged India's "chronic poverty, mass ignorance and disease" in a speech in May, but posited economic development as the answer. "Whatever is needed, I think, we need a high rate of growth," he said. In this new vision of India, a thriving, liberalized economy will deliver what decades of well-intentioned socialism did not. True, two decades after India's sweeping economic reforms began, poverty no longer defines India, but the basic needs of 800 million people remain unmet. Maoism survives and thrives on their resentment, says Sudeep Chakravarti, author of Red Sun: Travels in Naxalite Country. "It's a deep, deep anger over India's failure to do what it has always promised." Like the Taliban in the mountains of Afghanistan, India's Naxals take refuge in geography. Their biggest safe haven is the Dandakaranya, a vast, thinly populated forest that sprawls over the boundaries of five states, with its heart in Chhattisgarh. The Naxals went to the Dandakaranya about 25 years ago: the movement began in 1967 as a protest by landless peasants in Naxalbari and, for a while, was a fashionable cause taken up by idealistic college students until it was put down during Indira Gandhi's draconian Emergency from 1975 to 1977. The Naxals resurfaced in the southern state of Andhra Pradesh in the 1980s, this time as a caste-based movement challenging the dominance of wealthy coastal communities over poor farmers in the interior. Andhra Pradesh lies just south of Chhattisgarh, so when security forces closed in on the rebels, they retreated into the forest, moving out of reach by crossing the state border. The Maoists set up a new base in the Dandakaranya and eventually found support among its indigenous groups: India's 85 million so-called tribals, who follow their own traditional religions, outside the Hindu caste system, and speak their own languages unrelated to Hindi. Over the years, various left-leaning parties have taken up the grievances of India's peasants and other lower castes, successfully bringing them into mainstream politics. Such groups may be just as poor as tribals, but they now rarely become Maoists. In tribal areas, on the other hand, no party is as well-organized as the Maoists. It is often said that the Red Corridor, the Maoist-affected area that stretches diagonally across central and eastern India, overlaps the map of the country's poorest districts. In truth, it more closely coincides with the tribal map of India, says Christophe Jaffrelot, a political scientist at the Center for International Studies and Research at Sciences Po in Paris, who has been studying India's poorest states for 25 years. "This is the key issue," Jaffrelot says. "Maoism has become a tribal phenomenon." Estimates of the Maoists' strength vary, but they are believed to have as many as 20,000 well-trained, armed fighters permanently assigned to roaming camps, and perhaps another 100,000 militia members who live in their own villages. Once the movement is established in a village, everyone is expected to be part of one of its clusters, or sangams — the children'ssangam, the women's sangam, the farmers' sangam and so on. In theory, the sangams mobilize tribals politically, but in practice, their real advantage to the Maoists is military. Their core cadres move constantly through the roughly contiguous forested areas across central India, camping for two or three days at a time in villages that have no choice but to host them. They very rarely use mobile phones, communicating instead via human courier. This has made Maoist operations nimble — their networks are now active in 20 of India's 28 states — and nearly impervious to technical surveillance. On the ground in Dantewada, it is this human network, much more so than the terrain, that has made the fight against the Maoists so difficult. Mishra, the former police superintendent who now heads Chhattisgarh's anti-Naxal intelligence ops, vents his frustration: "First, the sangams will give the signal that the police party is coming. Then there will be the people's militia; they will also fire on you, they will try to distract you. And if you successfully negotiate them, then only you enter the third core, the Naxals. That happens very rarely." When the police do receive intelligence, it is often at least two days old — it takes that long for an informer to reach a police station on foot. So when a police party goes out on patrol or on a mission, they are very vulnerable, as in that bloody April ambush. E.N. Rammohan, a retired Indian Police Service officer who authored the report investigating that incident, says the police also lacked the support of the people in the village where they had camped the night before the attack. Officials believe this area was the likely source of a tip to the Maoists. Mishra says the only way to ensure his troops' security is strength in numbers. The Maoists control about 4,000 sq km of territory — where neither police nor forest officials have any presence — with just 1,000 full-time armed fighters, Mishra estimates. This no-go zone includes the village of Jagargunda, once a forest trading post and now the site of a camp for those displaced by the fighting. "Once in three months, I undertake a supply operation there," Mishra says. "I use around 1,000 men to secure a 60-km stretch of road." Local support has been key for the Maoists, and it explains how they have been able to last so long. They arm themselves primarily by looting police stations in carefully-planned raids, overrunning a post with a swarm of several hundred people — a few trained cadres plus village irregulars armed with knives, bows and arrows. The effectiveness of this strategy was demonstrated most spectacularly in the February 2006 attack on an iron-ore mine in Bacheli, 10 km from Gumiyapal. The Maoists entered the explosives depot by commandeering a food truck; once past the gate, a few armed fighters easily overpowered the guards. Over the next four hours, the rest of the 700-strong attacking party stole some 50 tons of explosives, carrying out the cardboard boxes one by one into the forest on stretchers tied to bamboo poles. They are still working through their stash. Since 2007, there have been 172 Maoist attacks in Chhattisgarh using IEDs, among them the May 17 bus bomb that killed the men returning from Gumiyapal. What will it take to defeat the Maoists? Commanders on the ground have been pleading for more men and matériel, and after a July 14 meeting on anti-Naxal strategy the central government allocated funds for 34 new battalions of paramilitary forces, 20 helicopters, 20 new counterinsurgency training institutes and $214 million for better roads and bridges in 34 districts hit by Maoist violence. That commitment has renewed an intense debate within the ruling Congress Party and its allies over anti-Naxal strategy. India's security-vs.-development dilemma is similar to the "hearts and minds" debate that the U.S. has struggled with in Iraq and Afghanistan: Could adding schools and health clinics be more effective than increasing the number of troops in reducing the local support of Maoists? "We can't solve this problem by ignoring the hopes and aspirations of the people living in these areas," Digvijay Singh, a longtime Congress Party leader, wrote in a recent article. The prevailing view, however, is that India cannot deliver services without first restoring civil authority in areas that Home Secretary G.K. Pillai has called "lawless, a free-for-all." Upon announcing the anti-Naxal offensive in October 2009, Pillai optimistically predicted, "We hope that literally within 30 days of security forces moving in and dominating the area, we should be able to restore civil administration there." But Ajai Sahni, executive director of the Institute for Conflict Management in New Delhi and a leading security expert, concludes that this strategy "has produced neither security nor development." The official image of Dantewada as a vacuum of governance is not entirely correct. Outside of the Dandakaranya forest, in villages in Dantewada along the edge of the Maoists' so-called liberated zone, there is an uneasy coexistence between the state and the rebels. By day, people tend their paddy fields or gather produce from the forest while the police make occasional patrols; by night, the Maoists rule. Ram Kunjam, head of the local village council in Chingawaram, site of the May 17 bus blast, says that Maoists visit regularly in the evenings, intimidating people to make sure they go to propaganda meetings. But he says he is equally scared of the police, who rounded up a few people from the village as suspects after the blast. "During the day, it's the police," he says. "During the night, it's them." On this tense front line, security measures are impeding the few government services that are available. State health workers, for example, reach even the most remote, Maoist-controlled areas. Every 15 days, a medical helicopter goes from Dantewada into the forests, ferrying health workers who travel without security. On May 28, they delivered medicine to Jagargunda, the same place where the state police travel with no fewer than 1,000 men. Over the past year, health workers have immunized more than 11,000 children; given prenatal care to some 13,000 women; distributed antimalarial bed nets, iron and vitamin A tablets; and screened children for malnutrition. Their work has never been more difficult. "Things have collapsed in the last five years, not just changed," says Vishwas Tripathi, district program manager at the National Rural Health Mission in Dantewada. The Maoists don't interfere with their scheduled duties, he says, although they do sometimes ask for medicine "at the point of a gun." When asked if they are getting any government services, most of the villagers in Gumiyapal laugh. But one man points out that health workers go regularly to the Saturday market. "They give vaccinations," he says. "You can get medicine for an animal. They come with a vehicle, so if anyone is very sick, they will take them to get help." More qualified staff — this district of 478,000 people has only 12 doctors — would help. But the more urgent issue, say Tripathi and his colleagues, is the new security focus on Dantewada, which has made their work more dangerous. The police have been traveling in what look like ambulances, for example, because the Maoists have never targeted the health mission's vehicles. If the decoys are discovered, they too will become targets, Tripathi says. "Some government policies are against us." Schools, too, have become battlegrounds. Maoists have destroyed 80 school buildings since 2009, while security forces have occupied hundreds of schools, according to India's Ministry of Education. The bombings and occupation of schools led the U.N., for the first time, to include the Maoist insurgency in its most recent report on the impact of children from armed conflict. The Indian government responded by asserting that this fight was "not an armed conflict." India's war against the Maoists is indeed an armed conflict — and more. It is also a war of ideas, about who can better provide for the poor. That is a fight that India should win easily. For all their eloquent criticism of India's failure to address the needs of the poor, the Maoists have hardly done better. In the areas under their control, they collect taxes from villagers and royalties from contractors. They are even planning their own mining policy, with royalties much higher than the going government rates. But the Maoists spend most of the money defending that territory; they have made little progress in improving health or education in Dantewada, which according to local health authorities has just 22% literacy, the lowest of any district in the country, and high rates of malaria and cholera. "They have meetings and then they go back to the jungle," says Lakma Kunjam, a Gumiyapal villager. "They don't give anything to the common people." The people of Dantewada seem deeply skeptical, however, about whether the other India, the official India, can offer them anything better. In Gumiyapal, Maoist propaganda is directed at a new Tata Steel plant planned for the area. The state government plans to acquire 139 hectares of land, including 14.8 hectares in Gumiyapal, which would then be leased to the company. "[The Naxals] are telling us, 'Don't sell your land to the government,'" Kunjam says. "'That development is not for you.'" The message resonates because of the evidence from other villages nearby. In Kadampal, for example, all 800 residents were displaced by an expansion of the National Mineral Development Corp.'s iron-ore mine, but only a dozen got steady jobs. The rest get only daily wages moving baskets of muddy mining residue in a tailing pond, on the land where they once grew their own food. Donda Ram, the village chief, says that he is grateful for the houses built by the mine, as well as the electricity supply, but what they really need is better jobs. When the Naxals hold their meetings, "I go because I fear for my life," he says. "But what they're saying is true." This suspicion of what the rest of India calls development extends beyond the mines. I asked Ram Kunjam why he didn't just find work in Jagdalpur, the nearest city. "There, it's a struggle to find enough work just to earn enough to eat every day," he said. "At least in the village, we can get our food from the land." His attitude makes a certain sense. The best years of India's recent economic boom have created enormous wealth, yet have failed to create jobs for the vast population of rural poor. Between 2005 and 2008, annual economic growth ranged from 7.4% to 9.2%. That growth came, however, from sectors — services and manufacturing — with high productivity but relatively low employment, says Himanshu, an economist at Jawaharlal Nehru University in New Delhi. As a result, employment grew by only 0.17% a year, the lowest rate of jobs growth in three decades. The jobs that were created (4.4 million) between 2005 and 2008 were in the cities, not rural areas, where most Indians live and where employment actually fell by 2 million. Reversing this trend is crucial; unless jobs and incomes rise in the villages, India will never produce the billion-strong consumer class that the rest of the world has been waiting for. Perhaps the greatest irony about the Maoists is that a movement predicated on the idea of a one-party state, which recruits children for combat and has no tribals among its top leaders, has managed to position itself as a defender of pluralism and democracy. In a January interview given to the Swedish writer Jan Myrdal and the Indian civil-liberties activist Gautam Navlakha, the general secretary of the Maoists, Mupalla Laxman Rao, asserted that his party could "unify all revolutionary, democratic, progressive, patriotic forces and all oppressed communities." Here too India seems to have relinquished the moral high ground. This vibrant, multiparty democracy with a proud culture of open debate has become something else in its fight against the Maoists. The Committee to Protect Journalists warned in May that in Chhattisgarh "local reporters are regularly accused by police of being Maoists and by insurgents of being traitors." The few remaining NGOs operating in Dantewada say they too are accused of being Maoist sympathizers. Himanshu Kumar, a well-regarded Gandhian activist who lived in Dantewada for 18 years, fled in January when, he says, his closest associates started to be arrested: "It had become quite impossible to continue to work there." (Police official Mishra says one of Kumar's colleagues was arrested but that "there was no pressure on [Kumar] to leave the place.") Manish Kunjam, a tribal leader in Sukhma village, says the atmosphere in Dantewada is stifling: "The Maoists are on this side, the state on this side, and in between there is absolutely no space for any kind of democratic movement." India's first obligation is to do what it does best by finding a place in its cacophonous politics for the Maoists, despite their stated aversion to mainstream parliamentary democracy. Jaffrelot believes this is the only long-term solution: "If you want to defuse this threat, you have to either give them some space and look at them as doing some legitimate work, or you need to develop the place for defusing their propaganda." Rammohan, the retired Indian Police Service commander, has fought most of India's insurgent groups, and he too believes the only solution to the Maoist threat is political. But the Naxals, he says, will be harder to co-opt than militants elsewhere. Other insurgencies are defined by their demands — once you fulfill them, they are neutralized. The Naxals appear to have no specific agenda other than enforcing existing laws on land reform, and the right to food, health and education for the poor. India's failure to meet those promises, with or without the Naxals, is its great tragedy. "Our democracy is not a healthy democracy," Rammohan says. "It's a very sick democracy." To defeat the Naxals, India needs to figure out how to make itself well.